Coelacanths are quite different from all other living fishes. They have an extra lobe on the tail, paired lobed fins, and a vertebral column that is not fully developed. Coelacanths are the only living animals to have a fully functional intracranial joint, which is a division separating the ear and brain from the nasal organs and eye. The intracranial joint allows the front part of the head to be lifted when the fish is feeding. One of the most interesting features of the coelacanths, is that it has paired fins which move in a similar fashion to our arms and legs. Coelacanths are known from the fossil record dating back over 360 million years, with a peak in abundance about 240 million years ago. Before 1938 they were believed to have become extinct approximately 80 million years ago, when they disappeared from the fossil record. 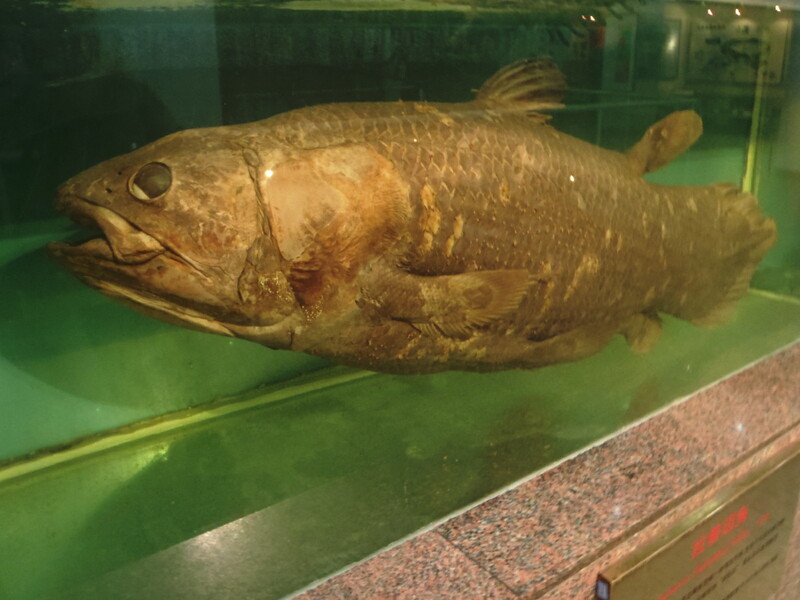 A Coelacanth specimen that was caught in 1938 is still considered to be the zoological find of the century. This ‘living fossil’ comes from a lineage of fishes that was thought to have been extinct since the time of the dinosaurs. Very interesting post. Maybe coelacanths and horseshoe crabs come from the same era and somehow survived until today. Cool! An excellent choice for the challenge! !